“We are going to make the zone around Calais watertight to illegal immigration”, declared the new French immigration minister, Eric Besson, when visiting Calais on 27th January. This declaration did not pass unnoticed on the other side of the Channel. Many British newspapers took up the story the following day and it did not come as a surprise. In fact, the UK has often been perceived until now as an Eldorado in the eyes of illegal migrants. There is a perception that Britain is a place where immigrants can prosper easily. Each year, thousands of people are trying to get to the "dream" island and Calais is their main choice to transit through. The UK border agency reported that in the last five years, UK officials have stopped more than 88,500 attempts of people trying to enter the country illegally. Of those, 61,000 were in Calais. As a result, the situation in Calais highly concerns and interests Great Britain. That is why Eric Besson asked for British cooperation with this project. “Our British partners must commit themselves more actively in the reinforcement of checks and security in Calais”, he said. Consequently, he will meet his counterpart in London on 8th February. But to make the region of Calais watertight is not the only issue Besson will have to resolve. There is also the problem of the 1,500 homeless migrants waiting in Calais and/or its surroundings to pass the border. Since the closure of Sangatte (the Red Cross’ accommodation centre) in 2002, these people are either on the street or in a squalid, a makeshift camp known as “The Jungle”. The situation is a real humanitarian crisis, and charities are desperately asking the government to set up a new shelter. Refugees action groups argue that those who faced torture and threats of execution deserve compassion and a shelter in the middle of winter. Besson’s answer to this request could not have been clearer: Building a new camp “is out of the question” he said. According to him, a new Sangatte “would create a powerful invitation to new networks of immigration.” In fact, around 1,800 people were arrested whilst trying to cross the border illegally in 2008. In 2001, just before Sangatte’s closure, they were more 14,000. But can we simply explain those figures because the shelter was shut down? One could also argue for instance that either the migrants found a better way of crossing the border and as a result get less caught or that maybe Britain has become less attractive... But it could also be a combination of the three. Since 2002, no minister had visited Calais, and no solution was on the table for the hundreds of migrants living there in dreadful conditions. 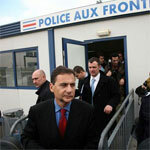 Eric Besson came just a few days after his nomination as immigration minister. We can see some progress and a show of good will. Unfortunately, it seems that so far, he hasn't had a clear idea on how to improve the situation.